The meadow has been on my radar this year. And judging from the requests I’ve received, it seems so have many of you. 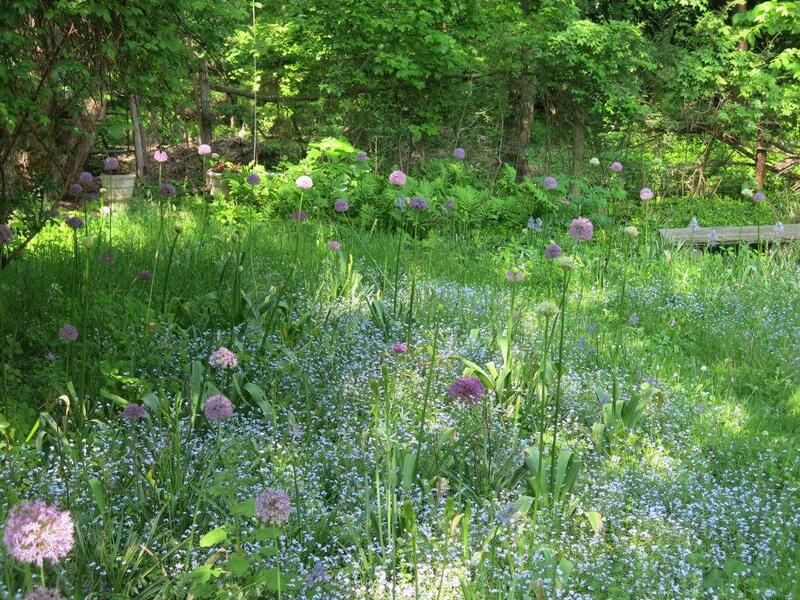 Primarily, you have asked to know the full story of my meadow and what ever else I can share on that topic. Here goes! Ever since I decided to do away with the lawn in the back garden about twenty years ago, I’ve pretty much let whatever grows remain as is. Except of course for scourges like garlic mustard. At the time, this was almost unheard of. I myself had never seen such a thing in a small, suburban garden. There was no handy literature on the subject available and it was way before Google. But I was very eager to try making a meadow ( of sorts). So I applied a dash of common sense and dab of creativity. Yes, I have often charged ahead based on that thought. Feel free to adopt it. It works. The very idea of a meadow is romantic right? One pictures a spread of assorted wildflowers dancing in the breeze, butterflies flitting around, birds singing in chorus, the sun shining, a blue sky dotted with fluffy, blue clouds. All inviting one to run through it carefree and laughing. This is actually not far from the truth. A healthy, robust meadow is a habitat in balance. The diverse plants and animal/insect life make for a self-sustaining environment. So much more attractive than a lawn! How could I resist trying to create such a place in my corner? 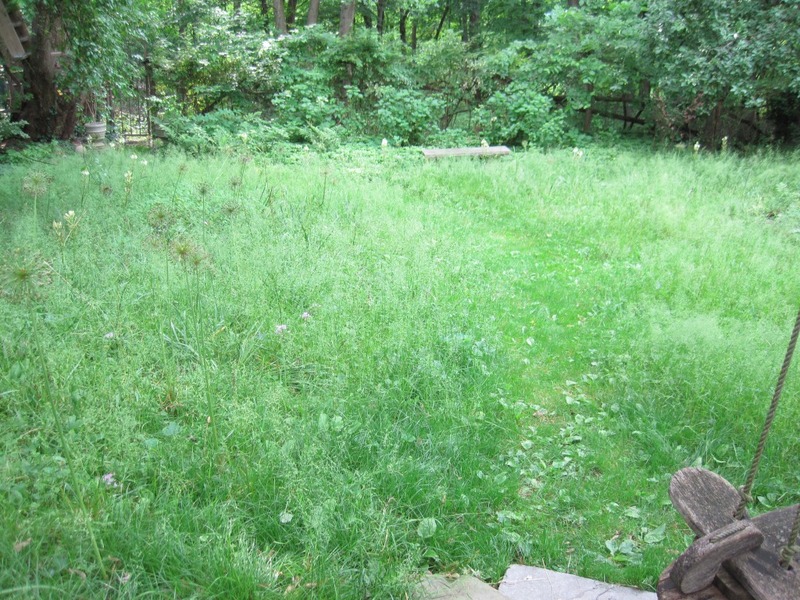 Like I mentioned, I stopped mowing the lawn and simply let it go ‘natural’.It took a few years for the lawn to give itself over to new settlers. Much slower than I’d expected but I had to see what really would grow. Turns out lots of green things. Not familiar at that time with the many native, wild plants, I had no idea what was what. But I did know that for the most part, wild plants are generally not given to big, showy blooms. If one compares a wild monarda to a cultivated variety, you will see what I mean. 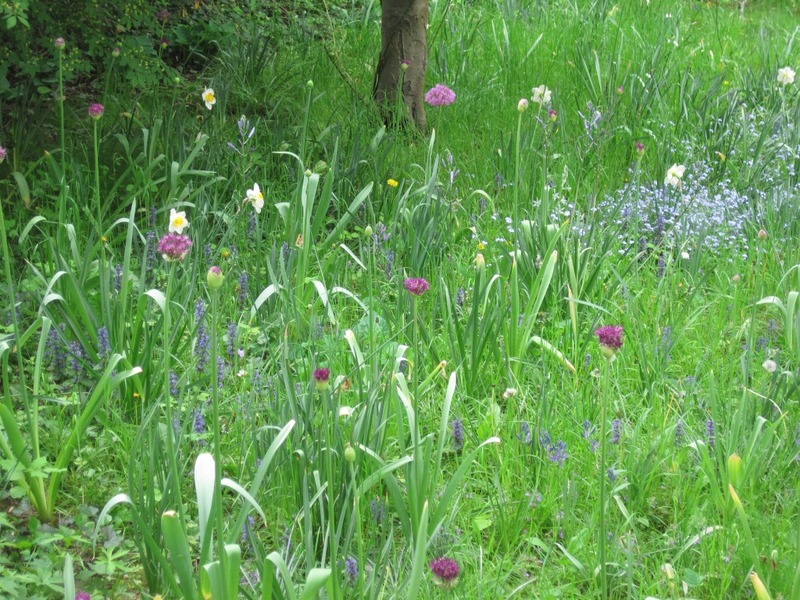 So apart from the happy splash of dandelion yellow and ajuga blue in spring, my meadow appeared mostly green. I wanted a little more oomph. For spring color, not wanting to inadvertantly introduce herbacious plants that could upset the natural balance, I hit upon the idea of putting in bulbs. Not given to being invasive or harming the environment but instead bringing in beauty and cheer, they are a perfect choice. 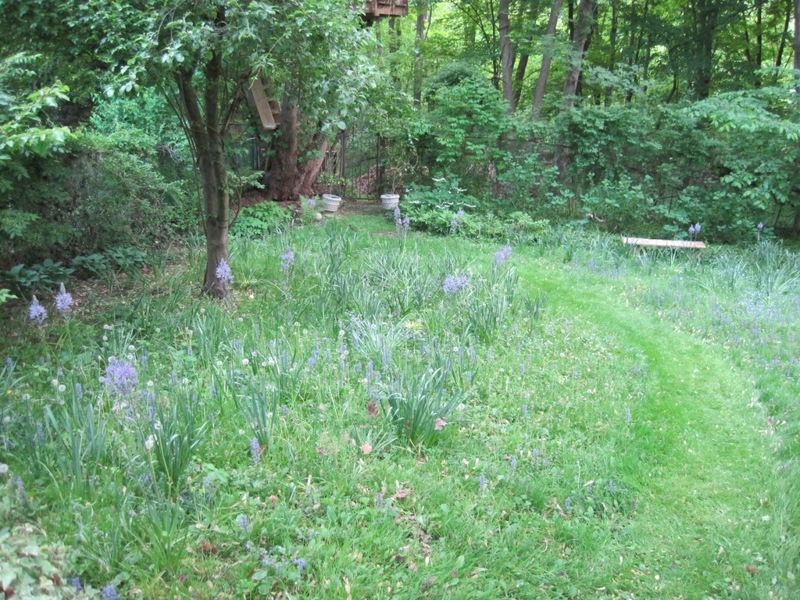 I started by planting hundreds of daffodils and over the years, I have added a whole host of minor bulbs such a crocus, wood hyacinths, leucojum, scilla, iris reticulata, anemones, ornithogalum (not so minor), small frittilaria along with a slew of alliums and camassia. The ajuga, mysotis and dandelions joined in quite naturally. 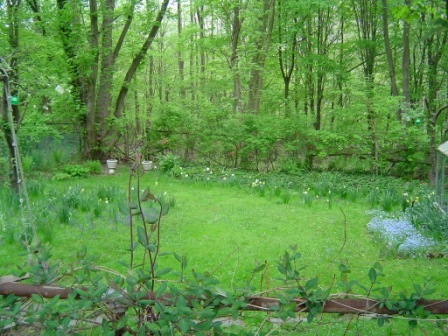 All of spring, this part of the garden reigns supreme. 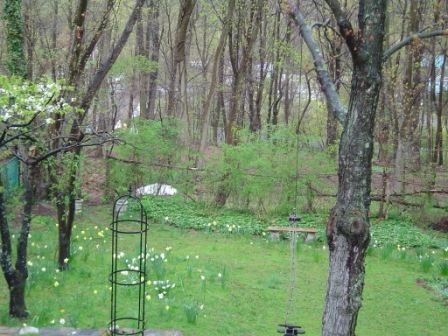 But for the rest of the growing season until the whole area gets mowed down, it looks kinda ‘meh’. And until recent years, I was gone for a good chunk of the summer so I didn’t particularly care. Out of sight, out of mind and all that. About four years ago, I started feeling a mix of guilt and responsibility to do right by the environment as well as my garden’s appearance. While the ‘meadow’ such as it is, is not harming anything and actually supports a variety of creatures, my state of inertia was losing ground. In my mind (okay, also my heart), a meadow is like a symphony. The myriad flora and fauna make up a full orchestra. Every meadow-member has a part to play. Nature is the artistic director and conductor. She is also the composer. The gardener is the manager. The four seasons are like the movements in a piece of music. The tempo, rhythm, mood, melody, instrument voices, expressions can all be compared to how life in the meadow plays out. The slower, quieter winter movement, the fresh, eager, excited spring movement, the loud, exuberant movement of summer, and finally, the poignant, somewhat melancholic autumnal one. Yes, kind of like Vivaldi’s Four Seasons. So you can understand my restless mind – I needed to improve my own meadow so it could play a strong, empowering symphony. It had not been allowed to perform at its fullest potential thus far. Many important sections of this orchestra were missing and so, the current concert was lackluster. With this in mind, I began researching (three cheers for the Internet), talking to those more experienced with native plants, visiting native plant gardens like those at the NY Botanical Garden, Teatown Lake and Reservation, private properties, attending talks by the likes of William Bryant Logan and Edwina von Gaal. On road trips, I braked for meadows and investigated them. Behind the ‘researching’ hides my propensity to procrastinate. It buys time before screwing up courage and launching into big projects. I took my time. Meadows are generally seen as large open spaces blessed with sunshine. 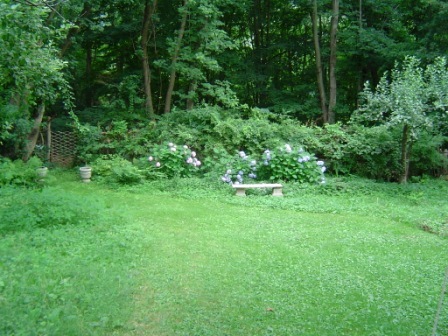 My meadow is assigned a small space in semi-shade. The word meadow is a slight stretch. But it is too open to call it woodland. So meadow it is. 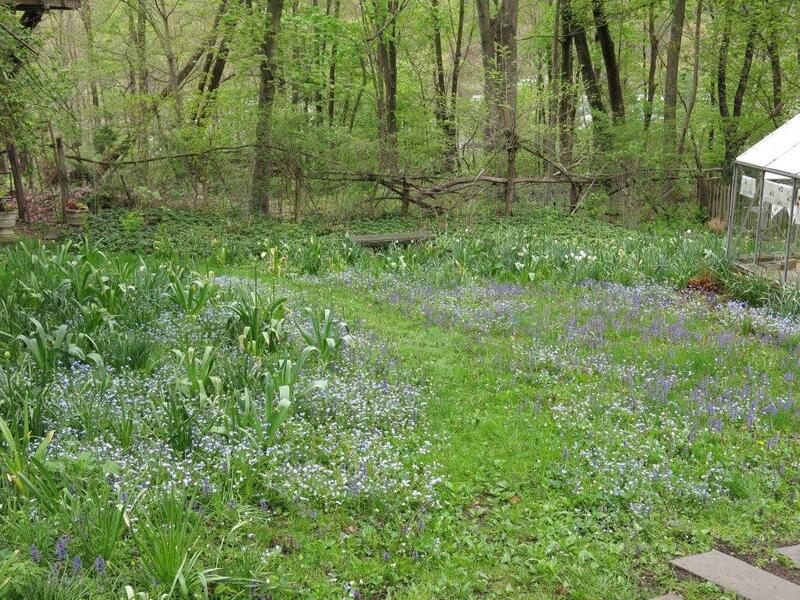 Native plants that could accept being in a suburban, somewhat obscure orchestra were sought out. They might seem unambitious but their skills and ‘sounds’ are no less commendable. I had to give them a fair audition. 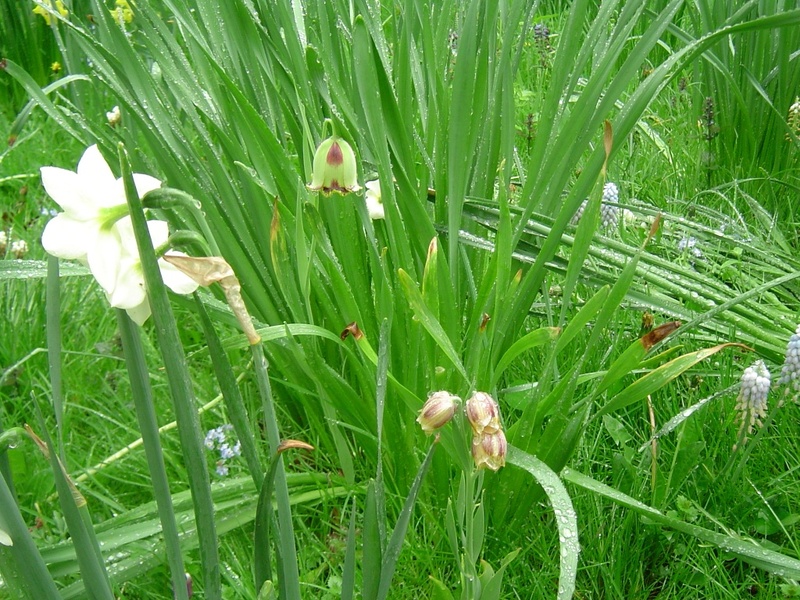 Finally, this year, I introduced a number of different plants to the meadow. Given the time pressure of my annual Garden Open Day in early May, getting these new additions in was something of a scramble. But it got done. And then I turned my attention to all the other demands of the season. 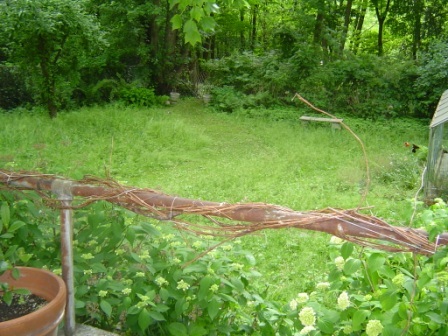 Native plants are hardier and tougher than non-natives – that gave me permission to not worry about the meadow. In the frenzy of getting the garden ready for Open Day, I failed to consider that it had not rained sufficiently and young plants need some extra TLC. By the time it occurred to me, we had already had a few super-hot days in addition to the lack of rain. And given that the meadow was now thick with growth, telling the young, new plants apart from the old, was near impossible. It was a sea of green. So I’m not really sure whether some if not all of the plugs have made it or if some decided to go dormant or if all bit the dust. I have since done some intermittent watering but it feels like closing the barn door after the animals have escaped. Still, I’m optimistic. I suspect at least some of the plants would have pulled through. 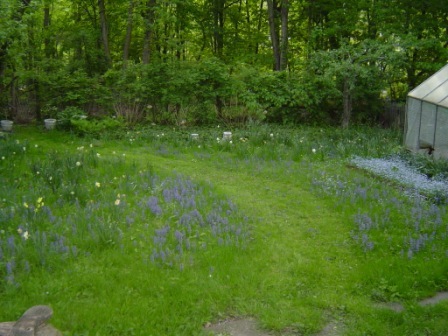 Patience is called for – I must give the meadow another full year before determining anything. Meanwhile, I’ve been investigating meadow establishment further. Stay tuned for part II next week! This entry was posted in All Gods Creatures, Deep thoughts, Move It, Seasons Greetings, The Garden Demystified, Your Garden and the Globe by pgbundil. Bookmark the permalink.